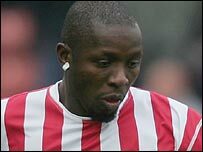 Stoke insist they will hand out a harsh punishment to stayaway striker Sambegou Bangoura when he returns to the club. The Guinea forward failed to return to pre-season training two weeks ago and he is yet to meet new boss Tony Pulis. Chief executive Tony Scholes told the club website: "To say the club is livid with him is an understatement. "We have not been able to contact him and his complete absense from pre-season training means we will deal with him in the harshest possible way."